What comes after “Marvel NOW!”? Whatever it is, it starts HERE. The vile face left movie audiences in shock after last summer’s Marvel Studios’ “The Avengers” movie, but who is this eerily disturbing villain? 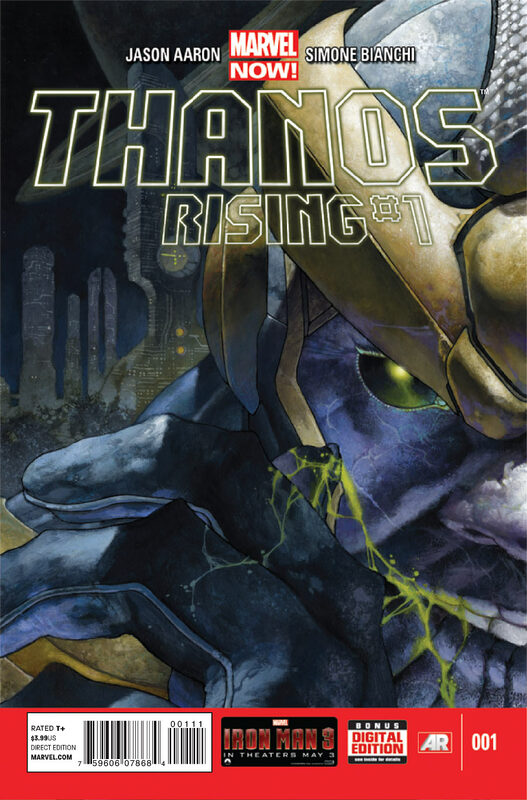 Thanos rises as the unrivaled rogue of wretchedness in this gripping tale of tragedy, deceit and destiny. Where did this demi-god of death and destruction come from and…more importantly what does he want? …but will soon change the very nature of the Marvel Universe. This is quite honestly the best use of Simione Binchi’s art ever for me. I found his rendition of Storm very drag queen meets Mad Max Thunder Dome but it’s strangely at home with Thanos, capturing and conveying the emotions of our would be villains early years. We witness the birth of Thanos and the mental breakdown of his mother when she either recognizes what he will become or is simply driven mad by giving birth to a mutant eternal possessing the deviant gene. Over the course of Thanos early life he is clearly ignored by his brilliant father with who he shares a scientific mind. He also initially isolates himself from peers due to his perceived “differences”. One aspect of the tale I think was excellently done was Jason Aaron touching on how he was treated by his parents and peers. This opening tale begs the questions are we born the way we are or is the socialization process responsible for who we become? The Nature vs Nurture debate is ripe in this tale. If we had time we could also talk about the “In Groups” and “Out Groups” present on Titan. Thanos friend, that very creepy little girl also points out that oftentimes our friends also influenced by different socialization processes have an even bigger impact on us. I loved the slippery slope that Jason Aaron presented for how Thanos becomes. Aaron also makes young Thanos very sympathetic and relatable something I have never experienced while reading anything Thanos related. Also worth noting is the deliciously detailed cover! THE RISE OF MARVEL’S GREATEST EVIL CONTINUES BY TWO OF THE MOST ACCLAIMED CREATORS IN COMICS!! Continuing the jaw-dropping origin of the mad Titan who will soon change the face of the Galaxy! Death follows young Thanos as his inner darkness grows. The cover was cool but not as awesome as the first issue. This issue found Thanos the once innocent and introverted mutant Eternal of Titan growing in intellect and confidence as he cuts a swath across Titan allot like Hannibal the famous cannibal and murderer from the Silence of the Lambs series. This one lacked many of the sociological tingling that made the first issue so fascinating. 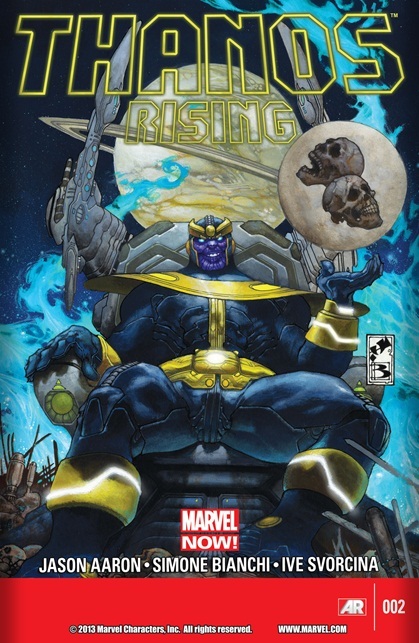 Thanos disintegrates into a murderer for the sake of scientific curiosity and to discover who he is. As a naruto fan I can’t help but see the parallels between Thanos and Orochimaru. The patricidal twist at the end was predictable. The art was also not as good as the first issue.